As gun battles raged in the hills above Dili in May, rival factions from the East Timor army held their fire after they witnessed an incredible sight. Rebel soldiers from the western region of the country were zeroing in on the home of army chief Taur Matan Ruak, and loyalist soldiers from the east were defending it. Suddenly, a vehicle drove into the epicentre of the mêlée, and as bullets rained over it a Timorese nun popped her head out the side window and brandished her veil. Sister Guilhermina Marcal, a stoic Canossan nun, was leading a daring mission to rescue Ruak's children, aged 3 years and 8 months, together with their babysitter and three other women who were left stranded in the home. As the vehicle came under fire, Marcal instantly thought of the best way to stop the shooting and secure safe passage. Emerging from the car, Marcal told the soldiers to put down their weapons, and later they helped to push-start the car. As the Catholic Church in East Timor mobilised in April for a massive humanitarian operation in the wake of the country's political crisis and ethnic violence, many stories of bravery and outstanding service to the people have emerged. Some, like Sister Marcal's, until now were left untold. Shui-Meng Ng, the UNICEF representative in East Timor, says that 'had the Church–the madres and the padres–not stepped in there would have been a humanitarian disaster'. "They provided refuge to the people, shared what resources they had. They were very pro-active, and they kept the peace," says Ng. The Church has been actively involved in this crisis from the very beginning, both as a safe haven for the people affected by it, and as a political player. 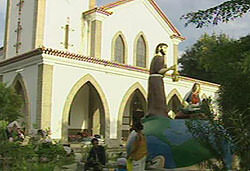 The Church has for more than a year been one of the most vocal critics of East Timor's first independent government. In April last year it staged a three-week demonstration against the government which involved trucking and bussing thousands of people into the capital from around the country, and then providing food, water and sanitation throughout. The highly disciplined Church network ensured that the demonstration remained peaceful and that it was not hijacked by other groups. The trigger for the demonstration was the government's plan to make religious education optional in government schools, and its failure to consult on the policy. But the strength and ferocity of the country's biggest demonstration since independence also reflected the community's deep-seated disaffection with the new government. The former government, dominated by Timorese who were exiled in Mozambique during the 24-year Indonesian occupation was perceived by the population as, at best, foreign and remote. The former Prime Minister, Mari Alkatiri, stands accused of arming civilian hit squads to wipe out political opponents – including Church leaders. The Alkatiri Government had attempted to sideline the Church after independence even though priests and religious stayed behind and defended and protected the people during 24 brutal Indonesian years. In turn, adherence to the Catholic faith increased four-fold to more than 90 per cent. 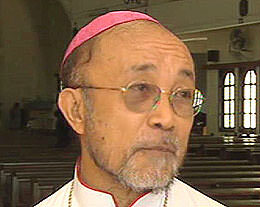 The Bishop of Dili, Monsignor Alberto Ricardo da Silva (pictured), says Church staged the demonstration because it wanted to give a 'voice' to the people. He rejects claims that the Church has acted like a political party and says it does not intend to continue to operate in this way in the future. The Church's role during the crisis came naturally, he says. "It is our job, we must do this. When it is difficult the Church must be ready to do what is needed." "It seems they did not have enough experience, maybe. East Timor is quite small, only one million people, it not so difficult to manage everything, but it did not happen." When the dispute between the government and a group of almost 600 sacked soldiers erupted into violence on 28 April, thousands of people immediately began fleeing their homes for the relative safety of church grounds. At a time when few people trusted their political leaders, the Church is by comparison a well-organised, highly effective institution that has earned the trust of the Timorese. One of the first places to which they fled was the campus of the Dom Bosco technical school in Comoro, on the outskirts of Dili. Brother Adriano de Jesus, the principal of the technical school, said that at about 1.45pm on 28 April people began flooding into the compound. A demonstration by the soldiers had been joined by other malcontents and gangs had begun rampaging through the city, burning cars and homes. Other church institutions around the city also drew tens of thousands of people until numbers peaked at more than 70,000, with just as many in camps outside the city. The crisis in East Timor that erupted in 2006 has led to the deaths of more than 30 people, the destruction of hundreds of homes and the dislocation of more than 150,000 people. The government's inept handling of a dispute involving soldiers from the western region of East Timor transformed a minor, manageable dispute into a full-blown inter-ethnic conflict that put the country on the brink of civil war. Much of what had been achieved since independence has now been lost. At the UN ballot in August 1999 the Timorese defied intimidation by their Indonesian occupiers and with a huge turnout voted 78.5 per cent in favour of independence. While the country was physically destroyed in 1999, it was at the very least largely unified. With numbers in the refugee camps still near their peak level, the focus has now switched to reconciliation and reintegration. The Commission for Justice and Peace has intensified its efforts to train church leaders in conflict resolution at the parish level. Recently, more than 30 people have undergone training in the Dili diocese. The Commission is planning to stage a 'Peace Concert' in October aimed at the youth – the cohort that has been lost. Marcal says many youths became 'diabolic' during the crisis, with crazed expressions on their faces. Some threatened to kill her. The end result is heartbreaking for so many Timorese. Says Marcal, "I never imagined, I never think about it. We think after we were free life would be getting better. 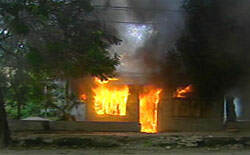 We rebuild East Timor back from ashes, now back to ashes." As the leaders of the world’s richest and most powerful countries gathered in St Petersburg this month, a few hundred activists were meeting in a dusty frontier town 350km beyond Timbuktu, for what they dubbed ‘the Poor People’s Summit’.